Macbeth, Shakespeare's last great tragedy, has remained one of the most popular plays since it's first performance in 1606 probably in front of King James. This exciting new audiobook production is directed with fresh imagination by Fiona Shaw who breaks the conventional strait jacket that has hampered the development of Shakespeare on audio. We are as much in the twenty-first century as in medieval Scotland the tensions, the politics, the struggle for power and dark ambition is part of our lives' This is also reflected in the sound world, with modern machinery and tanks. 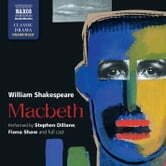 Macbeth is part of Naxos AudioBooks'exciting new series of complete dramatisations of the works of Shakespeare, in conjunction with Cambridge University Press. It uses the New Cambridge Shakespeare text, as used by the Royal Shakespeare Company and educational institutions across the world.